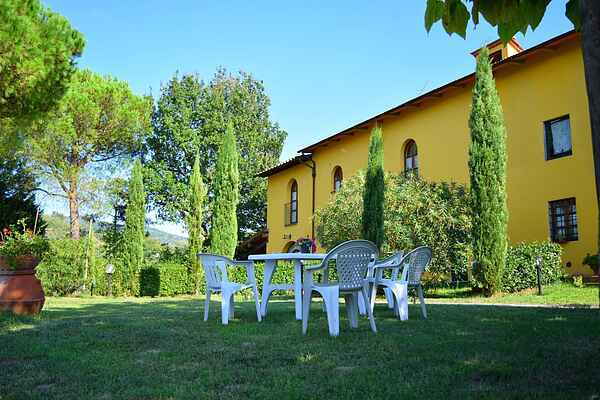 This apartment ( ground floor) is located in a typically Tuscan agriturismo in the area of Vinci. The agriturismo (6 different apartments in total) also offers a cosy garden with barbecue and a swimming pool, with a view of the hilly landscape. Vinci is, of course, also the birthplace of Leonardo da Vinci, also recently known from the book "The Da Vinci Code" from Dan Brown and the movie. You can visit the house where he was born as well as the Leonardo Museum in the castle. The magical landscape is still like Leonardos paintings and is very much worthy of them. This holiday house is also perfectly situated for visiting the famed cities of Florence (Firenze), Pistoia, and Pisa or, a bit further away, Lucca and Siena and the area beyond.